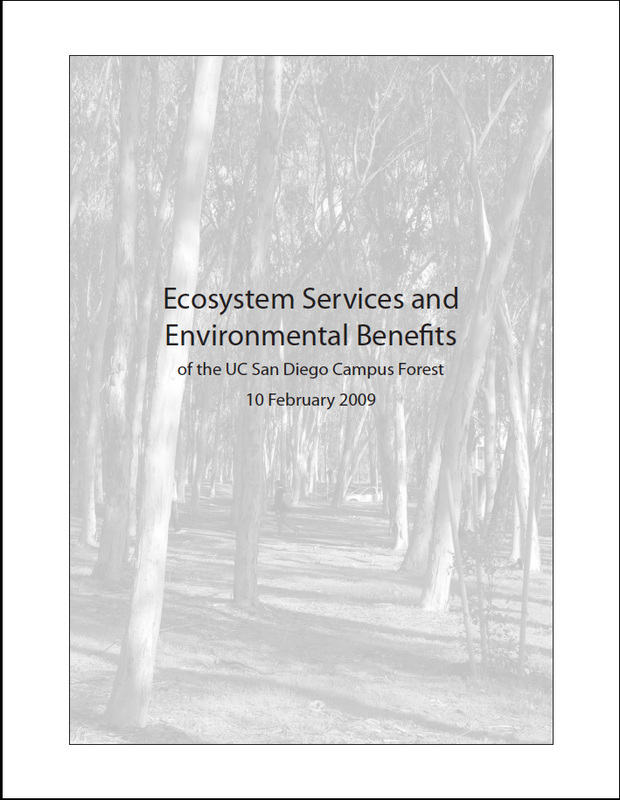 As part of a grant application, the ecosystem services of UC San Diego's campus forest were analyzed. This report presents the results of that analysis. The campus forest of the University of California, San Diego (UCSD), is a rich and varied ecosystem stretching from the Pacific Ocean across canyons and mesas. Many of the forest’s benefits are well recognized. The trees serve as a reminder of the campus’s cultural legacy and create a sense of place, a genius loci. They provide shelter and food for the flora and fauna that make their home there and create a more attractive environment for the people who live, work, and study at UCSD. But urban and campus forests also have a valuable role to play in increasing the sustainability of our built environments. The great contributions of the ecosystem services that the trees provide—sequestering carbon dioxide, filtering water, reducing energy use, and cleaning the air—are often overlooked. This study works to quantify these ecosystem services in numerical terms using the latest models and research and then translate those numbers into dollar values. UCSD’s campus forest includes more than 200,000 trees. The majority are planted in the 112-acre eucalyptus grove that runs the length of the campus. The remainder comprise a broad mix of 100 species planted along streets and around buildings. By consuming solar energy in the process of evapotranspiration and blocking winter winds, the trees of UCSD help reduce energy use by 12,886 MWh, valued at approximately $1.5 million. Through direct shade, the trees provide even greater energy conservation benefits. Without a complete inventory of the forest and information on tree location in relation to buildings, however, these benefits could not be calculated. As trees reduce energy use, they reduce the amount of carbon dioxide (CO2) produced at the power plant. As they grow they also sequester CO2 from the atmosphere. Together, these climate change benefits result in a reduction in CO2 of nearly 10,000 metric tons per year. This represents about 5% of UCSD’s annual emissions, valued at $450,000/year. The total amount of CO2 stored in the existing forest is 166,000 metric tons. UCSD is working to alter its stormwater management program and stop untreated stormwater and dry-weather runoff from entering the ocean. Trees can contribute significantly to improving water quality and reducing runoff. The existing campus forest traps and filters nearly 140 million gallons of stormwater each year, with a value of $250,000. Most of San Diego County, including the campus, remains on the EPA’s list of areas that do not meet federal ozone standards. In addition, small particulate matter exceeds federal limits on a number of days each year. Through interception and absorption, the campus trees remove 73 tons of air pollutants, with an estimated value of $1.8 million. Trees can also have a negative impact on air quality as some species (eucalyptus are particular offenders) produce one of the precursors to smog. When this is factored in, the air quality benefit is estimated to be $500,000 with a net 5.2-ton reduction in air pollutants. Trees also have an indirect impact on air quality by helping conserve energy and thereby reducing emissions at the power plant. As noted above, without a complete inventory of the forest and information on tree location in relation to buildings, these benefits could not be calculated. The total value of these ecosystem services provided by the campus forest is $2.7 million each year. The campus forest offers many other environmental benefits that are less easily quantified. When planted to shade parked cars, trees reduce evaporative emissions that contribute significantly to poor air quality. In a study in Sacramento, it was estimated that increasing citywide parking lot shade to 50% (as required by city ordinance) would reduce evaporative emissions by several tons a day. Tree shade also helps protect pavement by reducing wear and tear on asphalt. A Modesto study estimated that unshaded streets required more than twice as many repavings over a 30-year period than shaded streets. Finally, the trees of the UCSD forest are the lifeblood of the diverse ecosystem they support. The forest is home to more than 100 species of birds, small mammals and other plants, and serves as an overwintering site for the majestic monarch butterfly. The ecosystem services and environmental benefits as well as the cultural and aesthetic value of the existing campus forest are significant. There are a number of other ways that the forest can contribute to UCSD’s pursuit of sustainability in the future. Strategic planting to combat the urban heat island effect and to reduce energy consumption through direct shade, tree planting projects to sequester carbon, the use of tree waste material for wood products or as biomass for power production, and maximization of the tree-soil complex to improve hydrology are just a few and are described in greater detail here.